What an amazing treasure; I found a similar heirloom in my mother s house and I donated it to Lincoln Cathedral in England. I love to look at things like this made by little hands that have long since turned to dust. I get the feeling we are all in this together somehow. Are you going to take it to a restorer – I think I might if it were mine. 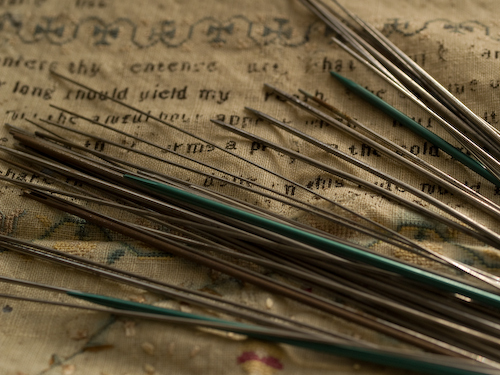 The knitting needles remind me of the lengths of scrap wire that small children in the u.k. used to knit fair isle and guernsey sweaters. Wow! Incredible that your family has preserved this treasure for so many years and now you become it’s steward. I’d call in a professional, it’s so precious. Thank you for sharing it with us but the best part, as always, are your musings. The sampler is worth a small fortune. Please treat with care and find someone to help you conserve it. Yes, they did stitch crowns into their needlework as a symbol of heaven. 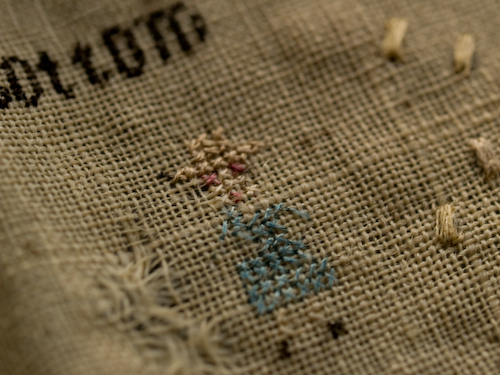 All the other stitched icons have meaning, too. You have an amazing piece of woman’s history in your hands. I’m going to pass this along to my MIL. 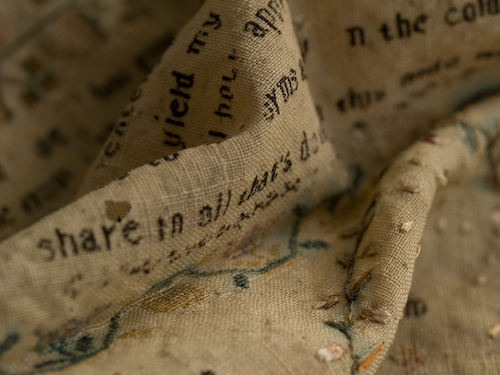 She has several connections in the textile preservation world. I’ll see if she has any thoughts. It’s beautiful! 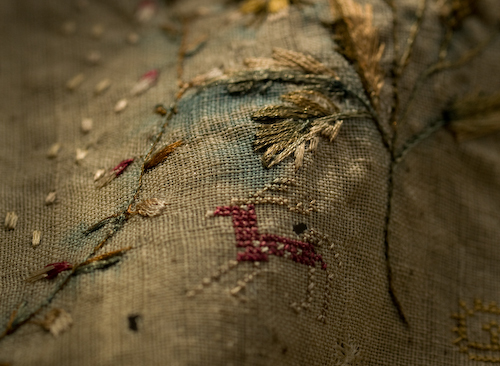 Contact the nearest museum with a good textiles collection and ask them about what can be done to stabilise/preserve it. They should also be able to tell you more about it. What a find! It is beautiful. That is such an amazing piece. I hope you are able to find someone to help you restore and preserve it. 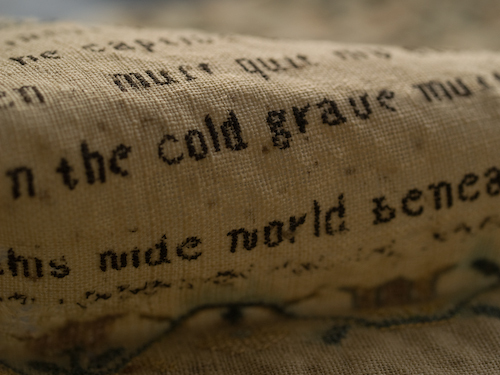 There’s a blogger (http://needleprint.blogspot.com.br/) who posts a lot about old samplers. Maybe she could help with yours? Unspeakable treasure. And you’ve done it tremendous justice already in the writing of this piece. I love how you describe taking to it with your camera and really starting to see it. It does force you to really peer at stuff and see objects differently some times. Please write again if you have success in following up conservation work with it! Hi! I’m MIL to Tracy (#5). It really is a treasure and you are commended to give it such respect. 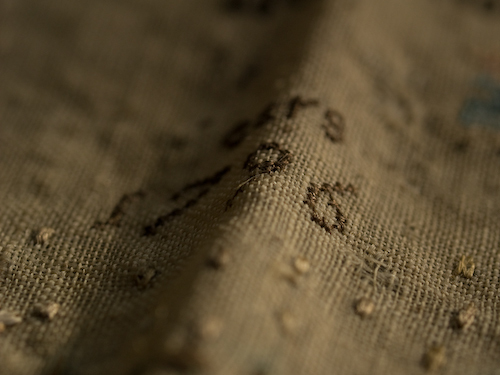 If you intend to keep it, don’t do anything, even iron, until you’ve contacted The American Institute for Conservation of Historic and Artistic Works (AIC). That can get expensive. 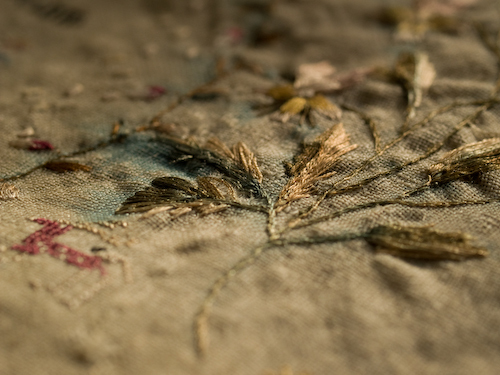 You might look for a reputable history or textile museum near Granny’s home or yours. If they accept it, they’ll conserve it. If they don’t, they may refer you to another collection. If you decide to keep it, research all you can (family heirloom? ), both provenance and care. Stabilize it, rather than repair, find an appropriate display, and enjoy! Thanks for that resource, Suzanne! Looks like there is a woman in Beaverton who could look at it for me. Beautiful. 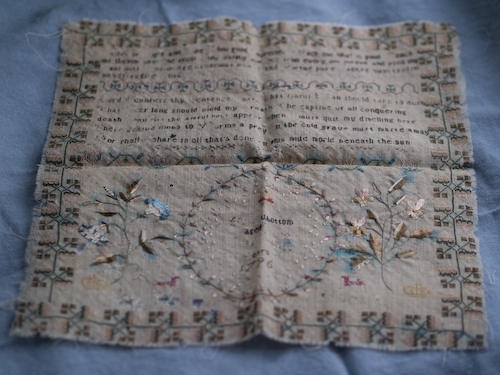 Even my reproduction samplers don’t look half as dainty as this wonderful piece. It is indeed a treasure, Sarah. and the blogpost you have written about its journey to you and your becoming entranced by it is also a treasure. Thank you so much for sharing this precious bit of your family’s history. Good luck in finding a competent restorer to help, if you decide to keep it, or a suitable museum that will preserve it. And do keep us all posted on what happens next. What a treasure, perplexing though it may be to know how to care for it. I love the idea of translating it into some other art, your handiwork. You’ve already done a fine job with your photos and words. 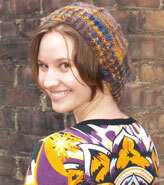 The lovely sampler is a treasure and you have already paid tribute to the artist by recognizing it’s beauty. 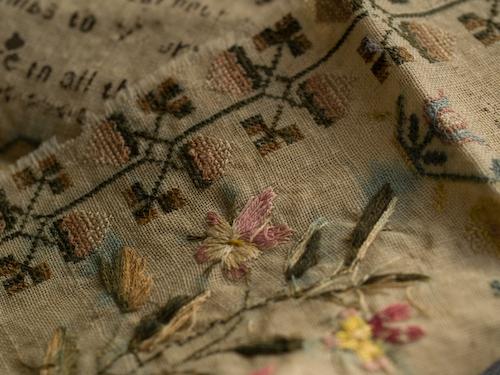 Besides consulting with a textile preservationist, I’d consider reproducing some motifs and creating your own sampler as a tribute to the unknown woman. Your post is beautifully written.